So I thought about how I'm not blogging much lately, and what I could have to write about these days, and I thought I'd switch off between reviews of the games I play with the girls, and the crafts we make. Today I thought I'd start with a little game called Ready Set Silhouette. 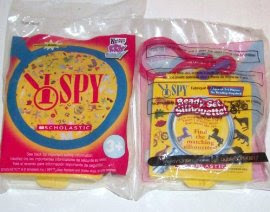 It's based on the I Spy books from Scholastic, and has all the charming little miniatures that I love to look at. Each picture card has 8 or 9 little things on a white background. 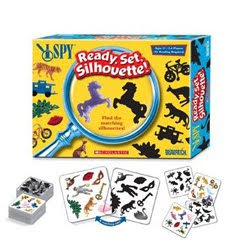 The object of the game is to find the matching silhouette card - clear cards with black silhouettes of the same objects. We have a mini set that came from a Wendy's Kids meal. It has a little plastic box on a keychain to hold the cards, and only 12 pairs of cards. This size is perfect for playing with Lizbeth (who is three). If there were any more cards, they'd get mixed up and lost, and/or she'd have a hard time looking through them for the matches. As it is, we can spend about 20 minutes playing the game, and I can be sure that all the cards have their matches and get back into the box. How do we like the game? It's simple enough for a three year old, but interesting enough that I don't get bored (it helps that it's essentially a sorting exercise, which my obsessive nature finds satisfying). The thing I like best is the moment when you've been twisting and flipping the card around, and everything finally lines up. There's a tiny outline of color, and then it's all black and white, neat and tidy. The game teaches things like observation skills of course -- deciding what are the important features to look for, and then actually finding them. It also has a good spatial reasoning component because you have to twist and flip the clear cards to get everything to match. All in all, I'd definitely reccomend this game -- though if I had a larger set, I'd probably only get out a few cards at a time. I'm so glad to see you blogging again! I was actually thinking about you today and how I haven't heard about your life in so long. Glad you're back. I've been microblogging on Facebook mostly. I wish there was a way to easily make all the social networks talk to each other so we don't need to check so many places.